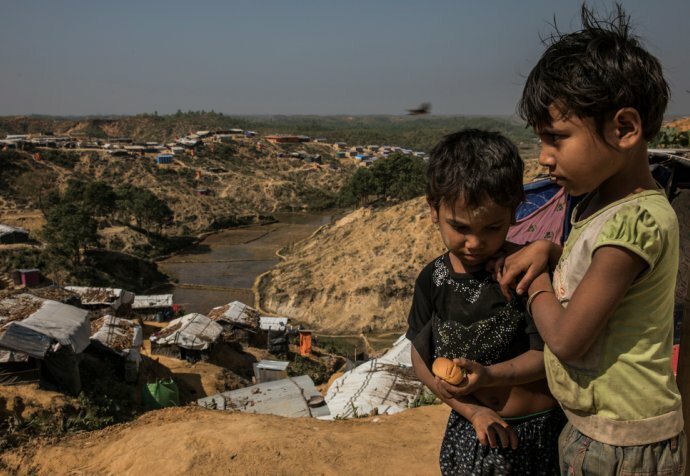 Like all areas in the Kutupalong-Balukhali mega camp, in Cox’s Bazar district in Bangladesh, Camp 17 is marked by frayed, coloured flags tied to makeshift bamboo and tarpaulin shelters. But what makes it distinct from other areas in one of the world’s most densely-populated refugee camps is that much of it is still unpopulated. "When the rain comes, not only do we anticipate flooding and landslides, but also an exponential increase in the risk of an outbreak. Latrines will go underwater, contamination seems inevitable"
"Estimates are that around 200,000 people are at risk and 15% of the camp could be flooded"
MSF has to date provided hundreds of hand pumped wells and drilled 25 deep bore holes for motorised pumps. ”Coupled with the borehole drilling and water pump installation MSF is also distributing water filters to the most vulnerable patients, such as mothers with children under 5 years of age and pregnant women"
“We were successful,” said Hosen, “but there is still much that needs to be done, like install a network and there are other boreholes that needs pumps, too. ”Coupled with the borehole drilling and water pump installation MSF is also distributing water filters to the most vulnerable patients, such as mothers with children under 5 years of age and pregnant women.